Industrial Production was slowed by hurricane Sandy and its growth rate is now in recession territory. 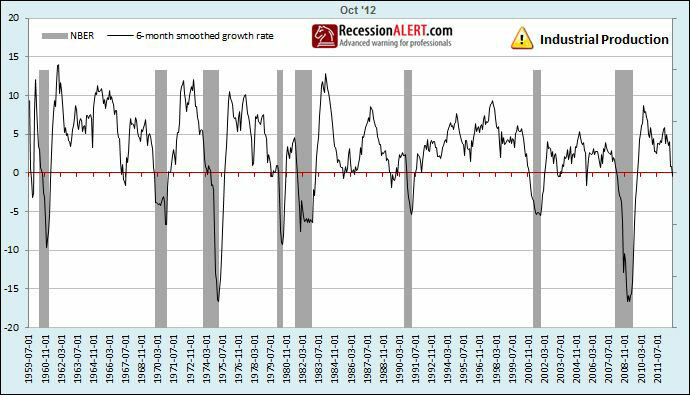 Bear in mind, for our “NBER Recession Model of last resort” we use a much faster smoothed growth here than the standard 12-month rate of change and therefore many other studies you observe on Industrial production may not be in recession territory yet. We have found the faster growth rate window deployed by our model to work the best for our composite model though. A recession signal from Industrial production does “not a recession make” and one has to view all the 4 NBER co-incident indicators together in a “composite co-incident indicator” to make a proper recession risk assessment. This “broad assessment” that examines ALL the indicators and their co-movements is adequately captured in our NBER Recession Probability Index displayed below which has Employment, Real Retail sales and Industrial production components from October and the Real Incomes reading from September (it only arrives at end of the month). 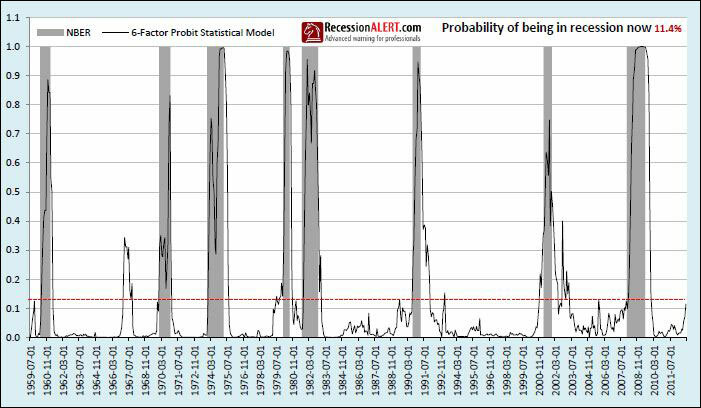 Recession probability is now in double-digit territory for the first time in this expansion. The red dotted line is the first recession confirmation (with 3 false alarms in the past) whilst a reading of above 40% (or more than 3 indicators in recession territory) virtually guarantees we are in recession. Note that the construction of our growth composite and the resulting NBER Recession Probability Index shown above is not a Markov probability model as used by Chauvet/Piger and published last week with a 19% probability of recession (see “Debunking 100% probability of recession“). The above Probability Index therefore does not revise past data up or down based on persistence explicitly modeled in the Markov-switching framework. The only way past data is revised up or down is through standard data revisions. To see a long-term study of the effects of data revisions on this NBER Model, see our research note “Effects of revisions on recession forecasting” What this means is that we can make “never before” type inferences that so many people erroneously made for the Chauvet/Piger Model. Incidentally, Marcelle Chauvet updated the model to include Septembers data (as it was only till August in the published version) and she advised me the model “should” reduce to around 10-12% for the September release. Those who have been following us since 2011 will attest to the fact that we do not call recession hastily, often facing ridicule as the more mainstream pundits vociferously call “recession right here, right now” (all the way back to January 2011) But what we will concede is that we are now becoming more concerned. What these probabilities tell us is that unless the U.S Congress does something constructive with the fiscal cliff issue a recession is virtually guaranteed in very short order. Although the co-incident data is showing us being right on the edge, the leading data is not concurring. What we are witnessing now is a result of the leading indicators that rolled over some 5 months back coupled with the effects of Sandy (which would not have factored into the leading indicators some 5 months back.). As we are “glass half full” in our approach we are inclined to give the leading indicators some benefit of the doubt here and bet that this is not a protracted decline set in stone (barring an external shock of course). A broad set of leading and co-incident labor/employment related indicators, as captured by our Leading Labor-Market Index (LMI) are not concurring with a “on the brink recession call” of the NBER model above. But recession probabilities of this model are just north of 6%, demonstrable with rising recession risk. What we like about this index is that all the six components are the first economic data to be released each month (normally first working day of each new month) and it therefore gives you a very early view on the status of the economy, whereas other composite indicators have to wait until the end of the month to get all their various components updated. Additionally, the Federal Reserve has been making noises of tying its outlook for borrowing costs to measures of employment and inflation. This means that for the stock market participant this (and others of its ilk) is going to be the indicator to watch in 2013. To get the very latest full reports on our NBER Co-incident Recession Model discussed here and the latest Leading Labor Market Index report, just go to the our service menu on our web site and download the latest sample PDF reports (no obligation, no emails required) that have all been updated to reflect the most up to date economic data as of today. The SuperIndex report is however 3 months old. To summarize, recession risks are indeed rising to the highest levels yet seen in this expansion, but provided there are no external shocks (wars, storms, tsunamis, nuclear incidents) or self-inflicted debacles (fiscal cliff standoff/brinkmanship and credit downgrades) then the economy should continue to pick itself up even if it languishes for a few more months as the effects of Sandy filter through. We make this statement purely based on the fact that the leading indicators have been rising for the last few months and one would expect them to filter through sooner or later to the co-incident data. As far as the stock market goes, the worst may already be factored in and we may be approaching the bottom of a “Great Trough” (see “The SP500 Great Trough Project“). The level of market breadth currently being witnessed is at a “95th percentile low” as shown below. It has occurred only 15 times in the last 25 years, shown by the red circles. Let your eye be the judge of how many of these were amazing buying opportunities for the stock market. If the leading indicators come through and pull the coincident data up by their bootstraps, and we avoid external shocks and all cliffs fiscal, then this will again prove to have been one of those truly magical times to be buying the market. We track other such “sentiment ” metrics that are showing the same thing. You can see these from the latest SENTIMENT report available for download from the our service section mentioned above.